The submersible ”KL” is the perfect trailer for the silent sports enthusiast. This product has been designed to carry a large variety of recreational products such as kayaks, SUPs, surfboards, sailboards, canoes, bikes, storage boxes, coolers and other equipment. Use this trailer for your passion today and what you grow to love tomorrow. Lower height means less lifting compared to a roof mounted rack system. Mast is 40" tall from bottom arm. Arms engineered to work with most direct bolt on and wide bar clamp system including those form Yakima®, Thule®, Malone® and Hobie®. 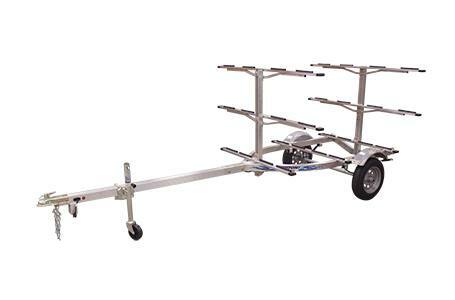 The base unit weighs in just over 170 lbs, easy to maneuver and tow behind small vehicles. Sealed lights on entire trailer including high visibility LED bullet markers. The tongue can be detached, masts and arms can be broken down for compact storage. Leaf spring axle with galvanized beam. Bearing lube grease system for long bearing life. Low profile for great aerodynamics and better gas mileage. Add optional mast system to increase what you haul. Cushioned arms can be secured at different heights. Meets US DOT and Transport Canada requirements. *4-5’ behind trailer, check local regulations Arm spacing measures from front arm to back arm(s); Arm length measures from center mast to end of arm Prices and specifications can change without notice. Recommended tongue weight 7-10% of GVWR. Five year limited warranty when registered online at tritontrailers.com. Non-registered trailers have one year warranty. Other vendor warranties may apply.